A common stylistic fault is wordiness, using more words than necessary to express a simple thought. The following sentences contain often-heard expressions that contribute to a boring writing style. 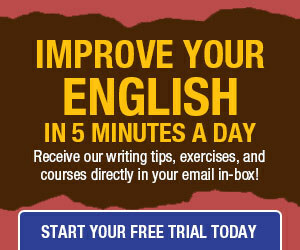 Edit the sentences to express them in fewer words. 1. As I finished reading the letter, I came to the realization that I had misinterpreted all his actions. 2. Their employer said three workers would be laid off due to the fact that sales had declined. 3. At that point in time the ship had entered the most dangerous part of the passage. 4. I want you to take my dog in the event that I must remain hospitalized. 5. Regardless of the fact that we have been friends for thirty years, I must report this to the police. Original: As I finished reading the letter, I came to the realization that I had misinterpreted all his actions. Correct : As I finished reading the letter, I realized that I had misinterpreted all his actions. Original: Their employer said three workers would be laid off due to the fact that sales had declined. Correct : Their employer said three workers would be laid off because sales had declined. Original: At that point in time the ship had entered the most dangerous part of the passage. Correct : Then the ship had entered the most dangerous part of the passage. Original: I want you to take my dog in the event that I must remain hospitalized. Correct : I want you to take my dog if I must remain hospitalized. Original: Regardless of the fact that we have been friends for thirty years, I must report this to the police. Correct : Although we have been friends for thirty years, I must report this to the police. Those sentences could use a lot more tightening than what’s been done here, and the corrected (“rewritten” might be a better word here as the originals weren’t technically incorrect) version of number 3, “Then the ship had entered the most dangerous part of the passage,” doesn’t sound right. Either “By then the ship had entered the most dangerous part of the passage,” or “Then the ship entered the most dangerous part of the passage,” sounds better to me. o Bill’s first point is valid. I eyed the redundant “to the police” in number 5. However, it is enough to point out the major improvements. Besides, as an editor, I wish to tighten up the writer’s style without depriving her of her unique style of thought and expression. o In my worst writing fault (other than being my own editor), I write overly complicated sentences. I do the same thing when speaking. The sentences parse correctly. The information flows logically. But you know it’s bad when even I get lost reading my own writing or when I can’t finish speaking my sentence because… uh, what was I saying? oo I think I did a pretty good job, breaking up the preceding sentence. 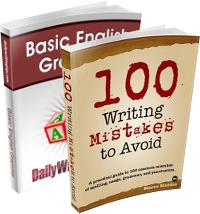 oo I often read the advice, “write the way you speak.” No, that’s often very bad advice. Better advice would be, speak the way you know you ought to write. Forcing yourself to think will improve not only your speech, but also the content of your speech.